>>>> Combine math and art with the ART of CIRCLES resources. Available here. Did you see the marble painting we did yesterday? It was great roly-poly fun and we decided that instead of just adding to our picture gallery we would use the designs to make a shape garland. We had lots of chat about which shapes we would use and decided to stick with circles, squares and triangles, as the children would find them fairly easy to cut out themselves. We went on a shape hunt to find objects the right shape and size to draw round and then we cut them out. We used our fingers to trace round the outside of the shapes and count how many sides they had. We did some shape sorting, making piles of circles, triangles and squares. We talked about size and lined each shape up from biggest to smallest. 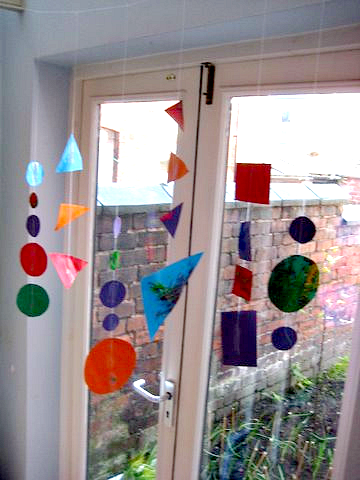 Then we used sticky tape to fasten our shapes onto thread and hung up our garland to decorate our room. The mobile looks beautiful as it twirls around. That’s a lot of fun learning from one simple activity. 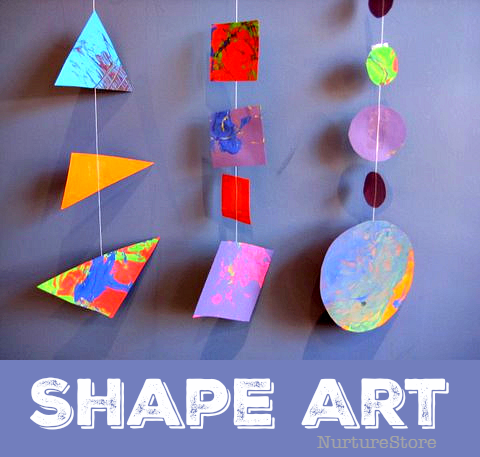 How do you teach shapes to your children? If you’re looking for play-based exploration and discovery of math and science concepts, come and take a look at our Fizz, Pop, Bang! Playful Science and Math Activities. 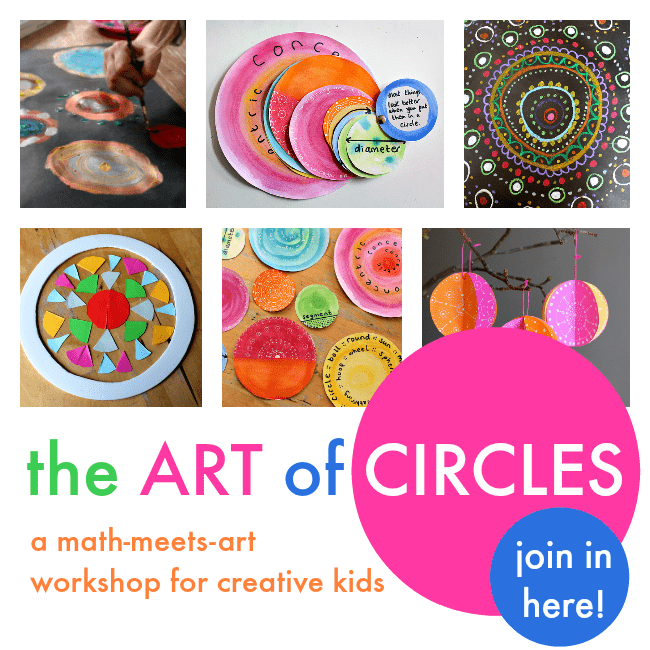 And for more math-meets art resources, join my ART of CIRCLES workshop. They are so simple and pretty, I love it! I forgot all about hanging leaves in my front window like I told the boys I’d do, this will be a great project to do instead! Thanks for the creative idea! I love how colorful they turned out. Hi There! I am visiting via ABC & 123. You have a fantastic blog!! This is a super idea that my little ones will also enjoy. Thanks for sharing. I have just subscribed via e-mail, looking forward to start receiving your posts that way. Have a beautiful week! What a great lesson. They look great hanging up! Thanks for all your comments everyone. I always think it’s a great way to learn if you can take something and explore it in lots of different ways. How did you attach it to the string? I want to do something like this with my prek students. Hi Bethany. We just used a clear sticky tape – easy!